FOR PREMIUM AMPLIFIED FACTORY SYSTEM RADIO REPLACEMENT. DOUBLE-DIN and SINGLE-DIN PROVISIONS INCLUDED (COMBO INCLUDES : DASH KIT and AMP TURN-ON INTERFACE). This Item Is 100% BRAND NEW! Before you replace your factory radio with your new aftermarket radio, make sure you get the same parts a professional would use. Whether you’re installing an Alpine, Blaupunkt, Clarion, JVC, Kenwood, Panasonic, Pioneer, Sony, Valor or another stereo, you’ll want to get the right parts with the best fit and finish, get genuine Metra Products. Some “SELLERS” say they will send you what is “available” at the time. They substitute cheap, poor quality generic products for the Metra Harnesses and Antenna Adapters (when applicable). Wouldn’t you rather get what you paid for? Don’t fall for cheap substitutions that come in plain plastic bags, don’t fit right and should cost a lot less. This Complete Radio Install Kit comes with good instructions on removing the factory radio as well as installing your new one. Factory Sealed Packaging and 100% BRAND NEW! Recently many radio manufacturers started making Double Din Radios with 7 inch screens (some slightly smaller). These Double Din Radios are about 7 inches wide x 4 inches tall. Unfortunately this new size “DOES NOT” work with Metra Installation Kits without modifications. These kits have been manufactured for years before this new size radio became available. As far as we know, none of the aftermarket kit manufacturers are using this new sized opening at this time. The standard radio opening for this kit is approximately 6 7/8 inches x 3 7/8 inches or 173mm x 98mm. If you have one of these larger radios, you will need to SAND or FILE the opening to make it larger. Unfortunately at this time there are no other alternatives that we know of. (Additional Features and Item Specifics Below). DASH KIT and AMP TURN-ON INTERFACE. FACTORY ROCKFORD FOSGATE SYSTEM. DIN Radio Provision with Pocket. ISO Mount Radio Provision with Pocket. Double DIN Radio Provision. Stacked ISO Mount Units Provision. Retains Factory Air Vents, Hazard Button, & Passenger Airbag Light in Original Locations. Quick-Release, Snap-In ISO Mount System with Custom Trim Ring. Removable Oversized Storage Pocket with Built-In Radio Supports. Contoured, Textured and Painted to Match the Factory Dash. Heavy Duty ABS Plastic Construction. METRA MITSUBISHI DATA BUS INTERFACE. Designed to be used in vehicles that have the Rockford Fosgate audio system. The MITO-02 supplies a digital signal to turn the amplifier on. When installing a radio that has navigation built-in, the MITO-02 can supply VSS (Vehicle Speed Sense), Parking Brake, and Reverse. Reverse is not available on manual transmission vehicles. If vehicle is equipped with Bluetooth, that feature will be retained. (1) Metra Radio Housing 99-7011. (1) ISO Trim Plate. (2) Double DIN Brackets. (1) Double DIN Trim Plate. (1) Removable Storage Pocket. (1) Metra Amp Turn-On Interface. (1) 14-Pin Harness with RCA’s. (1) Vehicle Side Harness. Metra Amp Turn-On Interface. We provide our services as a courtesy for International Buyers (ANYONE OUTSIDE THE USA). We are a U. To research whether the part they are ordering will fit, work or is compatible, with their vehicle, before purchasing. 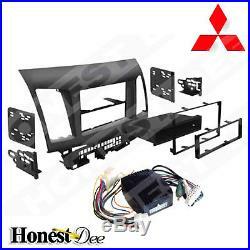 The item “99-7011 Car Stereo Double-Din Radio Install Dash Kit for Lancer with Fosgate Amp” is in sale since Wednesday, June 13, 2012. This item is in the category “eBay Motors\Parts & Accessories\Car & Truck Parts\Other Parts”. The seller is “honestdee” and is located in Seal Beach, California. This item can be shipped to United States, Canada, United Kingdom, Denmark, Romania, Slovakia, Bulgaria, Czech republic, Finland, Hungary, Latvia, Lithuania, Malta, Estonia, Australia, Greece, Portugal, Cyprus, Slovenia, Japan, Sweden, South Korea, Indonesia, Taiwan, South africa, Thailand, Belgium, France, Hong Kong, Ireland, Netherlands, Poland, Spain, Italy, Germany, Austria, Bahamas, Israel, Mexico, New Zealand, Philippines, Singapore, Switzerland, Norway, Saudi arabia, Ukraine, United arab emirates, Qatar, Kuwait, Bahrain, Croatia, Malaysia, Brazil, Chile, Colombia, Costa rica, Dominican republic, Panama, Trinidad and tobago, Guatemala, El salvador, Honduras, Jamaica, Viet nam. INTERNATIONAL BUYERS (OUTSIDE U.S.A.): PRODUCTS SOLD ARE FOR VEHICLES IN THE U.S.A. ONLY! Tagged: 99-7011, dash, double-din, fosgate, install, lancer, radio, stereo.